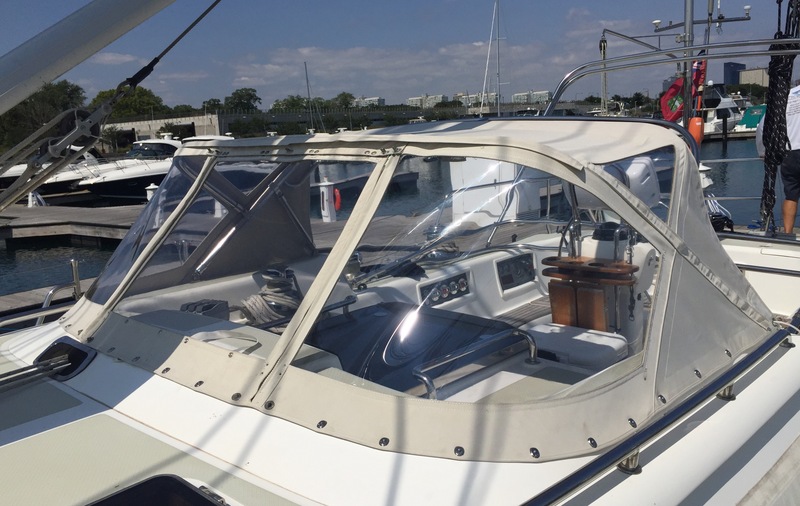 One of the services we offer here at Chicago Marine Canvas is window replacements. If your windows have yellowed, fogged up, cracked, shrunk, or expanded over time, replacing the glass can fix those issues. This sale boat owner contacted us about foggy, yellowed windows that he needed replaced. One of the first things we do before doing a window replacement is assess the quality level of the canvas. “How many years does it have left? What is your budget?” We have different qualities of glass that we recommend for different quality of canvas. This dodger was in great shape, so we recommended that the customer use a high quality glass that will last as long as their dodger. Before image of dodger in desperate need of a window replacement! For window replacements we usually take the window panel, or dodger in this case, back to the shop and carefully cut out the glass. Then we go back to the boat and snap it back on the boat. After it’s all snapped on, without the old windows, we use one of our labor-saving, cost-effective tools, our 3D measuring device and take measurements of your windows. Once we gather all of our needed measurements, we take off the dodger, and head back to the shop with it. Then our designer gets to work and designs the new windows using CAD (Computer-Aided Design) software, so we can make sure everything looks right. Then we send the designs of the new windows over to our plotter. Our plotter is another one of our labor-saving, cost-effective tools we use here at Chicago Marine Canvas. It quickly draws out whatever we design on the computer perfectly, saving us time and you money at the end of the day! After that, our seamstress cuts out the new windows and gets to work! For these windows we use Strataglass. Strataglass is one of our favorite products when it comes to glass for canvas that is brand new, or in great shape, like this dodger was. It’s the only glass on the market that offers a 2 year warranty! With proper care these windows will outlast its warranty, just make sure that you rinse them with water after you go out on the water, or after your boat has been on the dock to help extend the life of your new windows. Be sure to remove any sunscreen, harmful liquids, or sprays that may accidentally get on the surface. 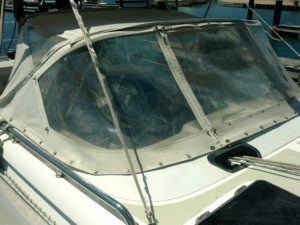 If your dodger, or enclosure is in need of a window replacement give us a call today! 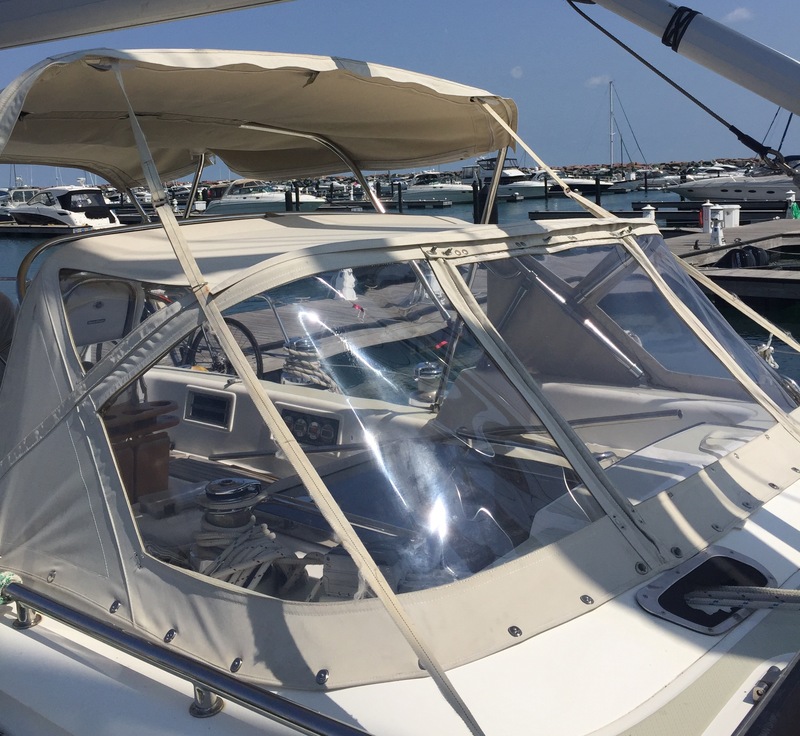 Chicago Marine Canvas is open all year long, ensuring our customers that their boat will be ready to go once the next season begins! Posted in Recent Projects and tagged dodger, dodger window replacement, strataglass, window replacement.